I volunteered abroad in Merida, which is the capital of Yucatan, a state in Mexico. It is a rather large colonial city with a population close to a million people. During my time there I volunteered in a physical therapy clinic that is called Sol y Luna. The clinic is unique because not only do they offer physical therapy, but it is also a school. 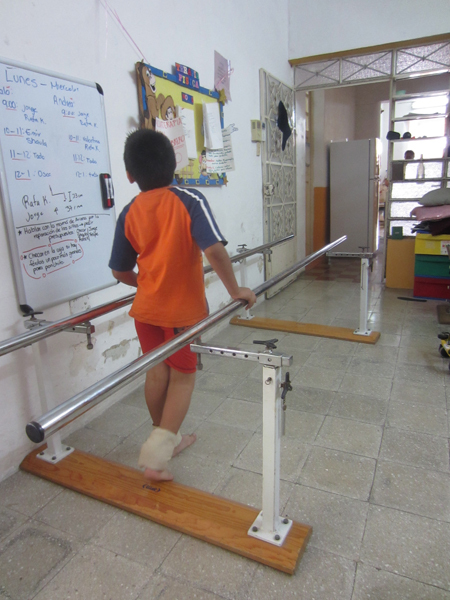 Most children go there every day accompanied by their mothers, who help them in class and in physical therapy sessions. The environment was very warm and welcoming, and they were very appreciative of help offered from the community. My primary role at Sol y Luna was to assist the mothers and their children while they were doing their various exercises. I was an appreciated extra set of eyes and hands. 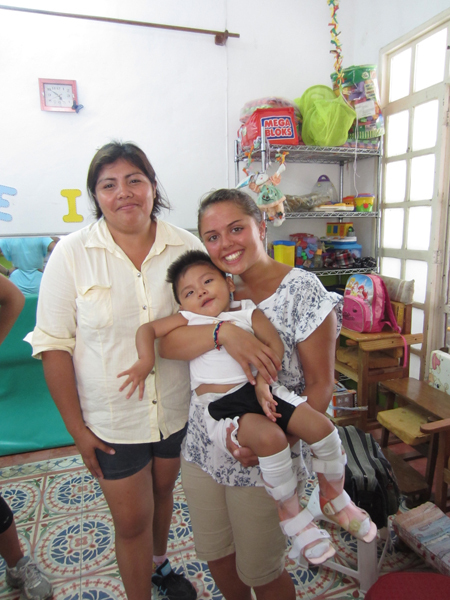 Sol y Luna had access to a limited amount of resources and because of this there was only a physical therapist present at the location two days a week. Because of this, the other volunteers and I were vital to the success of the location. A major reason that I wanted to volunteer abroad is because I absolutely love helping others. I’m very involved in a variety of volunteer experiences at home and I wanted to continue with this type of work while I was abroad. By choosing to participate in a volunteer experience abroad, I felt like I’d be more integrated into the community and the culture as well. My career goal is to become a physical therapist, so I wanted to be involved in something related to this field. In the end I got to learn a ton about physical therapy while being in a different country and communicating in a foreign language! How much the people I worked with respected me. Even though I wasn’t able to communicate completely fluently and wasn’t a licensed physical therapist, they were so appreciative of everything I did for them. The mothers, children, and physical therapist that I had worked with made me feel very welcome at the clinic. As I continued coming in regularly, I started form bonds with a lot of the mothers and children there. I grew to truly care about their progress and development. The appreciative attitudes of the mothers and the smiles on the children’s faces are the things that made me want to continually go back week after week. I will never forget all of the amazing people that I met and things that I learned while I was there. The welcoming environment of my workplace. All the people I worked with appreciated my help and always wanted to know when I’d be back. The physical therapist that I worked with always tried to include me when she gave instructions to the mothers too, so I was able to learn by watching her. In addition, the children and their mothers invited me to outside activities in the community; and because of this I was able to form great relationships with a majority of the families. I was able to finance my trip abroad because most of my academic scholarship from my home university could be transferred to my study abroad program. I was very fortunate because without this financing I wouldn’t have been able to afford the experience. While I was abroad I was able to stay on budget because I made sure to only use cash wherever I went. By doing this I never spent money I did not have! I did my best to assimilate. The primary divide that I faced was the language barrier. I went to Mexico to learn Spanish and become more comfortable with the language – and I believe I did just that. By putting myself out of my comfort zone I was forced to speak the language of my host country. After the experience that I had, I feel confident that studying abroad is one of the very best ways to learn a language because you’re completely immersed in the culture. Besides speaking a different language, I always made sure to respect the different cultural values held by the people who lived there. For example: eating when and what they ate, greeting the way they did, and wearing the type of clothes they did. By doing this I felt like I was not just a foreigner. My return after studying abroad was a much more difficult transition for me than I would have ever imagined. I had become so accustomed to my life in Mexico that all I wanted to do was go back. I missed being in an environment where everything was new and different, because I felt like my life at home was so routine and commonplace. I loved having the opportunity to not only learn about a new culture, but also being able to experience it. I found myself comparing a variety of cultural differences between what I was used to at home and all of the new things I had learned about Mexican culture. I felt like my time abroad had gone by so fast. It was a dream that I wanted to keep dreaming. I would absolutely love to study abroad again if I could, but I wouldn’t be able to graduate in time if I did. However, studying abroad has definitely opened my eyes and has made me want to continue traveling, experiencing new cultures and meeting new people. Once you start traveling it becomes addictive. I’ve caught the travel bug and would love to keep traveling for the rest of my life if I could. After experiencing one culture I would love to see what else is out there and become a part of it if I have the opportunity to. The world has so much to offer and I want to take in as much of it as I possibly can. After volunteering abroad in a setting that is very similar to what I want to do as a career, I can definitely see myself going abroad to work if I had the opportunity. I realize now that there is a great need for physical therapists not only in the United States, but also in other countries as well. Even if I never got the opportunity to have a permanent job as a physical therapist in a different country, I would still love to volunteer abroad and help others who may not have the resources to receive the medical care that they need. Mariah has made the excellent choice to volunteer abroad in her field of focus, allowing her to build cross-cultural skills as well as valuable pre-professional experience. We would recommend that Mariah consider teaching English abroad in Latin America or Asia for at least six months to a year. This length of time will allow for full immersion into her new host culture, and once she is settled in her new location, she could begin networking and looking for side contracts in her field. There is also an abundance of opportunities for health care professionals to work abroad with NGOs in developing nations. Teach English Abroad will give you the low-down on why teaching English abroad is valuable and how to build the experience into a lasting international career. What Expat Health Workers Say: The International Experience is a small collection of anecdotes from international health care workers may inspire those who are considering a career in health abroad.